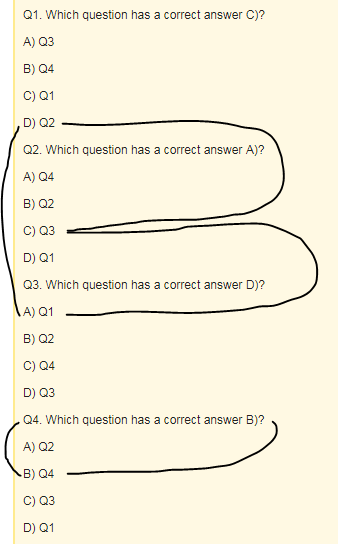 One day, a teacher decided to give unusual multiple test questions to the students. They were all surprised at the questions and none of them got anything correct. Can you help them? Q1. Which question has a correct answer C)? Q2. Which question has a correct answer A)? Q3. Which question has a correct answer D)? Q4. Which question has a correct answer B)? Q1 has answer as D option whose value is Q2. So Q2 should have its answer as C option whose value is Q3. And that is where we started off. Now Q4 is remaining. The answer to Q4 should be itself as all other questions are covered. So the answer for Q4 should be option B whose value is Q4 itself.